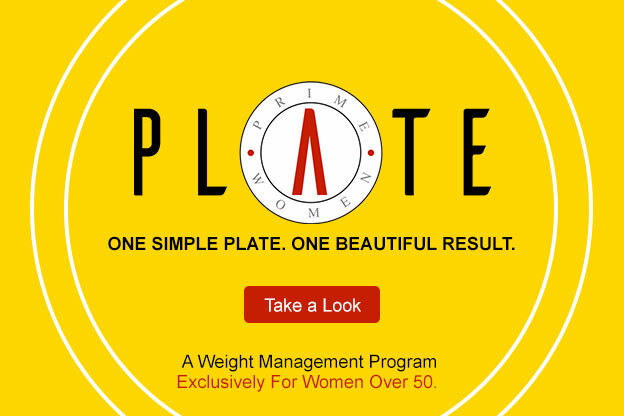 Prime Women is pleased to announce PLATE – the first weight management program designed exclusively for women approaching or over 50. We’ve been listening and you’ve told us how hard you’ve found it to lose weight after 50 or even younger when hormones begin to rage. We’ve also heard you tell us that you would like to know other women who are also Prime Women. So we took one of your biggest concerns, staying at a healthy weight, combined it with your desire for community and came up with a program that we believe is the best on the market for our age group. The program was developed in collaboration with Dr. Kathryn Waldrep, practicing OB-Gyn, with 35 years of experience in treating and counseling women from childbearing age to end of life. She has witnessed firsthand the havoc hormones play on a woman’s weight and her ability to lose weight. After menopause, a woman’s metabolism is likely to go down 10 to 20% each decade. No wonder losing weight after 50 is so difficult! And diets that work well for younger women and men do not work for the postmenopausal woman.